The pharmaceutical industry has zero tolerance for foreign material in commercial products. Visible inspection is one of the most common methods for detecting defects and/or foreign matter. Ideally these are caught as part of the quality control process of companies where there is no health risk to patients and minimal public relations damage. Once detected, specialized chemical analyses are required to determine the source of the problem. 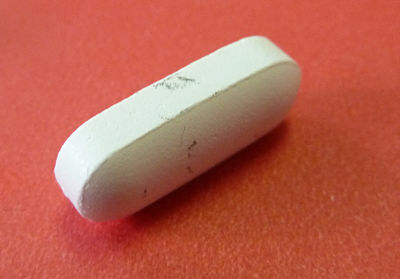 In this example of foreign material, small black marks were observed on the surface of white acetaminophen tablets. Scanning electron microscopy with energy dispersive x-ray spectroscopy (SEM-EDS) is one of the methods of choice for identification of unknowns, and is particularly good at identifying metallic contaminants. SEM-EDS provides high magnification images of the sample and semi-quantitative elemental analysis on defects that are ~0.5µm or larger. Defects and control areas near the defect were analyzed; however only C, O and Ti were detected in both locations. There was no significant difference in the concentration of these elements on or off the defect. This finding suggests that the defect likely contains one or more of these elements but does not allow the determination of the root cause of the problem. The sample was subsequently analyzed by Raman spectroscopy. Raman is also quite commonly used in pharmaceutical defect analyses since it is non-destructive and does not require any sample preparation for surface analyses. It has a similar probe size as SEM-EDS (~1µm) but is better able to identify specific organic and inorganic compounds. Spectra were acquired on and off the defect. The control areas contained primarily acetaminophen (peaks indicated by ‘*’ on the plot below) and anatase (a TiO2 polymorph). The defect area contained these two materials, and additionally showed a series of peaks unique to graphite. Because the contamination was thin and did not contain any unique elements (i.e. carbon was present in both the drug and the contaminant), EDS was unable to identify the contaminant. 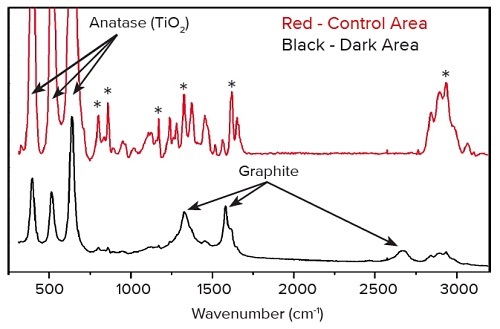 Fortunately, Raman spectroscopy is excellent at identifying allotropes of carbon. With the exact material identified, the manufacturer was able to locate and eliminate the source of the contamination.